In an interaction with scientists of National Institute of Oceanography, M. Venkaiah Naidu points out the need to step up research on ocean and marine energy to harness the marine resources for sustained growth of India. The Vice President of India, M. Venkaiah Naidu has called for fully tapping the enormous potential of the Blue Economy for the country to achieve higher economic growth. Interacting with the scientists of CSIR-National Institute of Oceanography (NIO), in Dona Paula, Goa Naidu pointed out that India was meeting most of its oil and gas requirements through imports and urged the scientists to step up their research in areas such as ocean energy and marine energy. “Scientists should study the potential of renewable energy derived from the ocean– from wind, wave and tidal sources”, he added. Asking the Institute to act as a nodal centre for Blue Economy related research and technology development, Naidu said there was a need to focus on ocean-centric technology to harness the marine resources for sustained growth of India. Development of technologies for deep sea mining, underwater vehicles and underwater robotics for extraction of minerals should be initiated. “NIO should also undertake research on development of drugs from the sea”, he added. The Vice President said that a focused approach in some of the areas such as minerals and energy from the ocean can make India a global leader and serve our national goals. “However, while pursuing the ‘blue growth’, every effort must be made by all the stakeholders, including private and public sectors, to prevent further degradation of the ocean and its ecosystems”, the Vice President cautioned, mentioning that “oceans produce more than 50 per cent of the world’s oxygen and absorb 40 per cent of the carbon dioxide, buffering the impact of global warming”. “In view of global warming, resource degradation and marine pollution, we have to conserve and sustain our oceans as time is running out,” Naidu said and advised CSIR-NIO to play a major role through its ocean observation studies in understanding different ocean processes due to climate change. Considering the importance of oceans on the life and sustenance of humanity, the United Nations has declared the period 2021–2030 as the Decade of Ocean Science for Sustainable Development. Further, the Sustainable Development Goal 14 (SDG-14) proposed by UN, which deals with life below the waters, emphasises the importance of oceans in modulating and sustaining life. The Vice President also lauded NIO for providing specialised services to society in addressing ocean-related problems. He also expressed happiness that the institute helped in preparing India’s claim for an extended continental shelf with an area of about a million square kilometres. “I am glad that two dedicated ocean-going vessels, RV Sindhu Sankalp and RV Sindhu Sadhana are managed by CSIR-NIO. With these two dedicated vessels, I am sure that CSIR-NIO will be able to carry out all the relevant studies in India’s Exclusive Economic Zone, which constitutes 2/3rd of our land area,” he stated. 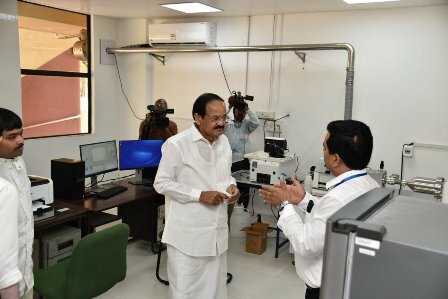 Thereafter, the Vice President also attended a presentation on various aspects and applications of oceanography and visited laboratories and exhibition galleries at NIO. Appreciating the good work being done by the scientists and scholars of NIO, especially in the field of conservation, he shared that it is important to prioritise efforts in ocean science and technology to achieve the national goal of transforming India to be the third largest economy in the coming 10-15 years.